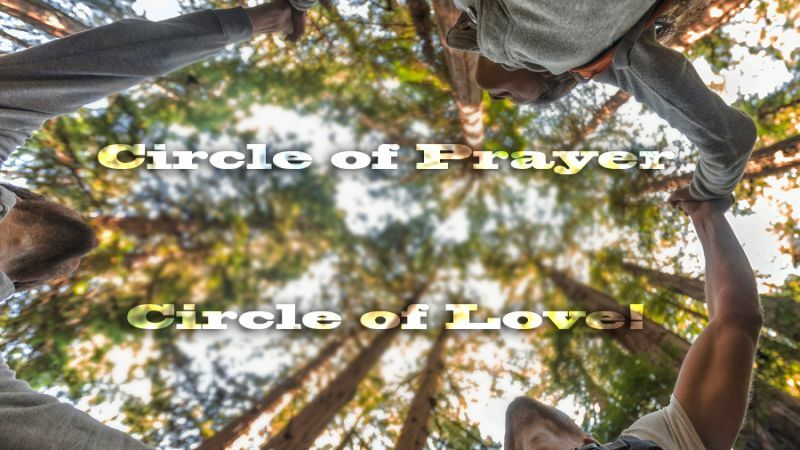 A Circle of Love: Too! When Jesus' family loves each other, even in our worst moments, we can find ourselves being carried! 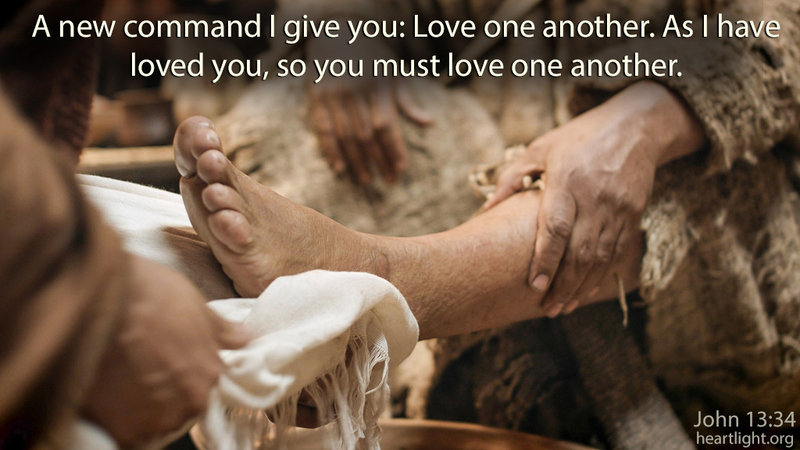 By this everyone will know that you are my disciples, if you love one another (John 13:35). Back in 1993 or 1994, I believe, heartlight.org published a story in the "Two Minute Meditation" section. It was about a man named Mark Knutson who was in the final stages of cancer. His community surrounded the home for prayer and kept a log book so he could know who had been there, praying for him. Mark Knutson was my father. I realize it's a long shot, but would it be possible for me to receive a copy of this article? Yes, Marcie was correct. We ran the article on June 26, 1996. I can't think of a better way for us to celebrate 20 years on the web than to take you back to that story from that first year! You can even read the original article and see how much has changed in our layout in the last twenty years as well as see how much I've aged. We reveal our identity in many different ways. Clothes tell something about our occupation or the group with whom we associate. Accents reveal where we live or where we grew up. Business cards reveal our occupation and phone numbers. Bio sheets tell about our education and job experience. After I had spoken on this topic in another city, a lady told me a story powerfully illustrating this point. A series of events in her town profoundly impacted everyone and gave witness to the character of Jesus Christ in the lives of a loving group of people. On August 28, 1993, Mark Knutson was diagnosed with cancer. It was an especially bad form of cancer, and he was already in the latter stages of it. He wasn’t given long to live. Mark was not well enough to receive visitors. He worried about his wife and two children. How would they hold up? Would they be loved and supported through his ordeal? On September 19, he received his answer. The Knutson family opened the window and saw the street filled with Christian friends. After completely encircling the house, the people joined hands and prayed. They prayed for Mark. They prayed for his family. They prayed for grace and strength. They let the Knutson family know they were loved. Unlike so many modern displays of concern, their care didn't end with one public display. For the next six weeks, groups from 2 to 20 would pray for Mark and his family in the corner of the yard. They kept a prayer register on the back porch so Mark could know who had been there without disturbing him. Some faithfully sent cards of concern and support while others helped with transportation and other needs of the Knutson's children. The Knutson family said, "We truly felt a hedge of love encircling our home." We cannot re-write the final chapter in Mark Knutson's struggle with cancer. Life is real, and none of us gets out alive. What matters most is that we love and are loved. We all need to know there is a hedge of love encircling our home. We all need to be part of that encircling hedge for someone else. Thankfully for the Knutson family, and their community, there was a group of people who demonstrated they belonged to Jesus. In a world of self-interest, there is still one distinguishing mark for a Christian. It isn't the sign in front of our church building, the bumper sticker on our car, the fish ring on our finger, or the crucifix we wear around our neck. Our real identity is demonstrated when we actively and consistently love each other. Let's make sure the proof of our discipleship is showing! We were excited to re-connect with Marcie and help her find the old article. I asked for an update that we might share with you to remind all of us of the importance of walking beside each other in love. Here, in Marcie's words, is her life after the original story. I was 15, and my older sister, Melanie, was 21 at the time of our father's passing. It was all such a whirlwind, as he was diagnosed in August, and passed in October of the same year. We had been raised in a Christian home, and our faith was very important to us. I accepted Christ at the age of 10 at a Georgia Camp. I went through my mountains and valleys when, at times, my faith was stronger than others. On the day of my sweet daddy's diagnosis, I fell apart, as expected, but somehow life continued to move. There was homework, basketball practice, and weekends with friends — and all the things you'd expect. We knew time was limited, but it never seemed too dark where the light couldn't be seen. Looking back, I now know we were being carried. It was incredible hearing stories even years later of people that had been praying specifically for peace for our family. Please don't misunderstand, there was heartache, despair, and plenty of tears being shed, but being wrapped in His arms was an unexplainable feeling. We miss our daddy, and I miss our community, who dropped everything to love on us. If my dad were still with us today, he would be the proud granddaddy to 7 beautiful grandkids. Another neat story I love to tell isn't about my dad, but about my son. At the age of 3, my sweet Logan was diagnosed with cancer. He was a happy, bubbly baby who never complained. After a weekend of nausea and vomiting, I took him to our pediatrician, who was also a close family friend. A sonogram showed what appeared to be a 13 cm tumor on his right kidney. I was directed to go immediately back to the pediatrician's office where she would be waiting for me. I walked back to her front door where she stood in the hallway, on the telephone. Her office manager, Jackie, walked Logan and me back into an exam room. As I walked by Dr. Alison Simpson, my friend for many years, I tried to get her attention. She turned her back to me and continued talking. For my outgoing, energetic friend to not make eye contact was completely out of the norm. I still thought nothing of it. We waited in the room for a few more minutes; then Dr. Simpson came in. Fighting back tears, she said, "They've found a tumor on his kidney, I'm working on getting you a room at Children's in Dallas. I've consulted with the oncologist and surgeon. An ambulance is in route from Dallas to transport you guys." Now at this point, I had been in the medical field for several years. I knew the terminology. I looked at my trusted friend and asked, "Is it life threatening?" She started to cry and said "Yes." From there on, everything was a blur. I called Logan's dad, who was working out of town, and had him head back home. I called my mom and stepdad, who were on their way out of town. My mom started sobbing uncontrollably saying, "I can't believe that baby has cancer." I still had not cried. Logan's dad was understandably emotional on our way to Dallas, and I kept saying, "He's going to be fine!" We made it to Dallas, and after a few days of complications due to fevers, it was finally the day of surgery. We were in the pre-op holding area meeting with the surgeons, oncologists, anesthesiologist, and other medical staff. I remember thinking the anesthesiologist was a little less than friendly, but as long as our baby was taken care of, nothing else mattered. What should have been a 4-hour procedure took 7. When the surgeon came to retrieve us, he looked exhausted. He started by saying Logan did great, and the surgery went well. He then said the tumor was substantially larger than what they anticipated. He stopped in the middle of the hallway and showed us a picture of the tumor as it was still wrapped around the kidney. He explained that what we thought was a 13 cm tumor, was actually a tumor the size of a volleyball, with "angry, vascular protrusions." It seems this tumor tends to double in size every two weeks. The surgeon showed us where to stand, and he went to go see if they were ready for us in recovery. When we finally got to see our sweet boy, he was sleeping so soundly. We were told in pre-op to be prepared for him to be on a ventilator for a while. Guess what, no ventilator! When it was time to go to our room, we rounded the corner and about 60 of our closest friends and family stood in the doorway, holding stuffed animals, flowers, balloons, and other gifts of encouragement and love. It was such a party that we were asked to keep it down. Logan recovered beautifully. He went on to receive chemotherapy, radiation, and learn to live life with his remaining kidney. Through the 6 months of treatment that followed his tumor removal and nephrectomy, we laughed, we played, we did life things! Logan is now a 16-year-old junior in high school who loves life. He doesn't remember a lot about those times, but he remembers wanting Home Depot hot dogs and "Daka-Pepper" after each radiation treatment. Needless to say, he got them! I truly believe that in life, Jesus Christ carries our burdens for us, many times without us realizing it. He gives us angels, in the form of our friends and family, to be there when we need a shoulder to cry on, and hand to hold, or an ear to listen. Whether we realize it or not, we are being carried! We thank Marcie for sharing her story, and we thank God for a church family willing to support those they love in such clear, powerful, and tangible ways. "A Circle of Love: Too!" by Phil Ware is licensed under a Creative Commons License. Heartlight encourages you to share this material with others in church bulletins, personal emails, and other non-commercial uses. Please see our Usage Guidelines for more information.